How to Play 4K Blu-ray on Philips TV? The Philips TV no matter OLED, LCD, 4K or HD model are widely praised by users, with features such as a voice guide menu, easy to read and navigate user interface, raised guide dots on key remote control buttons and large format support information so visually impaired people can reach customer care. Philips cares about accessibility and wants everyone to enjoy television. The point here is how can you play 4K Blu-ray on Philips TV smoothly? Read on for more info. The traditional way to watch 4K Blu-ray on Philips 4K TV in 3840 x 2160-resolution, you'll need to update your Blu-ray player to 4K Ultra HD and connect with Philips 4K TV for playback. If you don't want to spend extra money to have 4k support, just turn to solution 2. The Philips 5000 series Chromecast built-in UHDTV let you cast your favorite TV shows, movies from your mobile to TV smoothly. You can easily control your TV with apps you already know and love from your iPhone, iPad, Android phone/tablets, Mac or Windows PC. So, it's wise choice to rip and digitize 4K Blu-ray movies to 4K videos for streaming and playback via Chromecast from PC/Mac. To finish the task, a 4K Blu-ray ripper is needed (Review: Top 5 Best 4K Video Converter). Here, Brorsoft Video Converter Ultimate (Windows /Mac) is a blazing-fast, intuitive all-in-one media toolkit which lets you convert 4K/HD Blu-ray/DVD as well as XAVC (S), MTS, MXF, M2TS, H.265/HEVC videos into 4K/HD/SD variety of format such as WMV, MP4, MOV, MKV, AVI, etc. without losing quality. Besides, it also provide 150+ presets for widely using in Samsung/LG/Sony/Panasonic TV, Apple TV, Xbox, Chromecast Ultra and many more. Load Discs: Insert the 4K Blu-ray disc to the Blu-ray Disc drive and click the Load Disc button to have movies uploaded to the Program. You can also import ISO files, IFO files or Blu-ray/DVD folder for conversion. 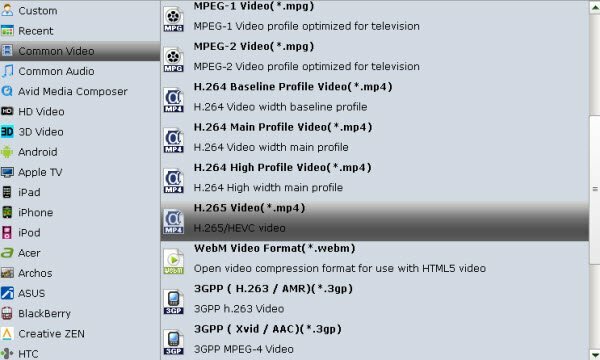 Click on Format bar, select "Common Video" from the format list and in submenu you can find “H.265 Video(*.mp4)”. Then hit on the small folder icon to specify an output folder. Philips 5000 series supports playing HEVC, H.264, AAC, MP3, JPEG and more formats on USB. To keep the Original 4K resolution of your 4K Blu-ray, please select the "original" drop-down option from "Size(pix)" catalogy. In this way the output Blu-ray movie will reserve the 4K resolution. With above settings, tap the big "convert" button to start rip and convert 4K Blu-ray to 4K HEVC videos for Philips 4K TV. Afterwards, you can get the ripped files via clicking the "open" button. Then following below steps to stream and play the converted 4K Blu-ray movies onto Philips 4K TV. 1. Please download Google cast extension here. After installation, there will be a Cast tab on the Chrome browser. You can click the option button to set video quality as Extreme or High for your Philips TV. 2. Drag your converted Blu-ray movies output files to chrome browser, or press Ctr + O to browse and import your HEVC/H.265 output files. And then HEVC/H.265 output files will be played in Chrome's built-in video viewer. 3. Then click the Cast current tab on your browser to stream media files to Chromecast and then play it on Philips TV.